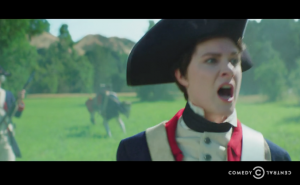 On the season premiere of the Comedy Central hit show “Drunk History” the incredible story of Deborah Sampson, the original #SheWhoBorneTheBattle was highlighted. Watch the full segment below on the “cross dressing, bullet digging, badass” Deborah Sampson, the namesake of the IAVA-led bill to pass to honor the sacrifice of women veterans. Deborah Sampson was a veteran of the Revolutionary War who disguised herself as a man and joined the Patriot forces and was the only woman to earn a military pension for her participation in the fight for American independence. WARNING: The above clip includes language that may not be suitable for young children.